Thomas de Hartmann was born on September 21, 1885, in Khoruzhivka, a small village east of Kiev in the Ukraine. He was born to an aristocratic Russian family. At the age of four he began piano lessons and in 1903, at the age of eighteen, he received his diploma from the St. Petersburg Conservatory. He was a graduate of the Imperial Conservatory of Music and studied composition with three of the greatest Russian composers of the 19th century—Nikolai Rimsky-Korsakov, Anton Arensky and Sergei Teneyev. In 1907, at the age of twenty-two, Thomas de Hartmann's ballet, The Pink Flower, was performed at the Imperial Opera House. Both Nijinsky and Karsavina were cast under Diaghilev's directorship. The Tsar was so impressed with de Hartmann's talent he personally granted the young composer a waver from military service to study composition in Munich under Felix von Mottl. In Munich, de Hartmann befriended poet Maria Rainer Rilke, painter Wassily Kandinsky, and artist and former Sufi Alexander de Salzmann, whom he later introduced to Gurdjieff. De Hartmann died in New York in 1956. 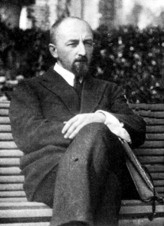 In 1916, at the age of thirty-one, Thomas de Hartmann, already a recognized composer in Russia, met Gurdjieff through his acquaintance with Andrei Zakharov2, a mathematician by profession and student of Gurdjieff. Gurdjieff, aware of his background, had de Hartmann meet him in a café frequented by prostitutes3 and other low life on St. Petersburg's Nevsky Prospect. Gurdjieff asked him why he wished to join the Work. De Hartmann responded, "Although happily married with enough money to live on and a life of music, all this is not enough. "4 He added, "without inner growth there is no life at all for me." In the memoir written with his wife, Our Life with Mr. Gurdjieff, de Hartmann described his life at this time as a search.5 Quoting a Russian fairy tale, "Go—not knowing where; bring—not knowing what; the path is long, the way unknown; the hero knows not how to arrive there by himself alone; he has to seek the guidance and help of Higher Forces." And so, following the abdication of the Tsar, Thomas and Olga de Hartmann followed Gurdjieff after he went to the Caucasus in 1917 and remained with him until 1929. In 1950, de Hartmann compiled a collection of the compositions he had made together with Gurdjieff. During a visit to London, he said about his musical collaboration with Gurdjieff, "It is not my music; it is his. I have only picked up the master's handkerchief. "9 In 1951, the de Hartmanns moved to New York to support groups there and in Canada, and to work with Mme Ouspensky. Thomas de Hartmann wrote the draft of Our Life with Mr. Gurdjieff in Russian; he died unexpectedly in March 1956 before the book was completed. Olga de Hartmann finished the book and it was published in 1964 in English. In 1992 the Definitive Edition was published; it included unpublished material from the Russian manuscripts and material from Olga de Hartmann's memoirs. It is considered one of the most valuable documents on the teachings of Gurdjieff. How do we perceive an object? Why that one object, out of so many? Something connects us with that one object, and not with others. It attracts our attention. We pay attention to it. It attracts our attention through one of our senses: our eye, ear, nose, and so on. Our eye, ear or nose pays out attention to the object. Our wishes, our desires, are connected with it in some way. We want to have it; or we want to avoid it; or we want to look at it more than we want to look at any other object. 2. Thomas and Olga de Hartmann, Our Life with Mr. Gurdjieff , ed. T.C. Daly and T.A.G. Daly (London: Arkana/Penguin Books, 1983), 1. 6. Gert-Jan Blom, Oriental Suite, The Complete Orchestral Music 1923–1924 (Netherlands: Basta AudioVisuals, 2006), 41. 9. Music for the Movements, Channel Crossings CCS15298, Wim van Dullemen , Quoted in the Historical Notes by James Moore and Jeffrey Somers for a Piano Recital, London 1988.